BMW's design chief, Christopher E. Bangle, is the first to admit and justify that the new car, internal code E46, is an evolutionary statement. "When we make a revolutionary model change as happened with the jump from the E30 to the E36, its successor will be evolutionary," he said. "This keeps customer confidence and residuals high, and allows us to perfect the basic design. I can tell you now that the E46's eventual replacement will be revolutionary." 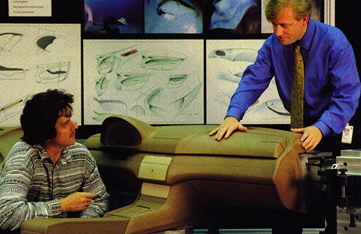 Five and a half years have passed between the initial design and complete car launch in April 1998. 2400 parts are completely redesigned and made 130 prototypes by hand and 2.6 millions of working hours invested in the E46. That is highest quality standards, and these require perfection to the last detail Chris Bangle and his team has done fine work. From any angle, the new E46 3 Series is smoother, sleeker and more rounded. In isolation, the E36 still looks good, but when you see them together, you realize just how its more chiseled shape has aged. The new headlamps with twin semi-circles of their lower edge can be called styling rather than design, but it does give the car a distinctive look and more BMW-like "face." If you think the exterior is merely evolutionary, the interior is the place where great improvements have been made. 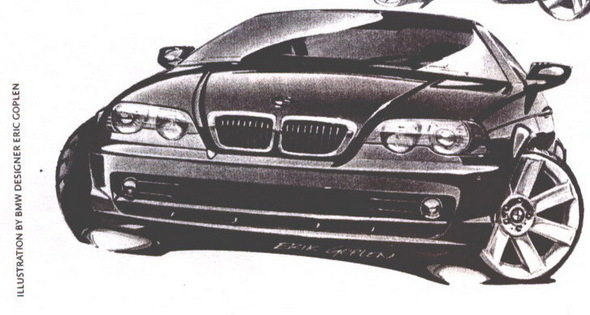 Ergonomically, the E36 was close to being perfect, but it had two key flaws. One was the driving position and the other was rear seat leg room . The former gave a great seat to pedals to steering wheel relationship, but the steering wheel in both left and right-hand drive cars was skewed slightly. This created a back problem for many people on long drives. These sufferers will be pleased to know that the steering wheel of the E46 is perfectly aligned. The longer wheelbase and better overall packaging has given rear seat passengers noticeably more legroom, and the interior feels bigger even if it is still far smaller than a 5 Series. The choice of materials is excellent, and the trim feels expensive. A single section for the dashboard cuts the chance of squeaks and rattles. The cloth trim is good, but the leather is even better. Matched to the optional burr walnut veneer, it makes for a very classy interior. The wider center console is part of the visual flow that leads you into the car. The new 3 Series looks good. It has a fuller, broad shouldered stance, even on standard wheels and tires. Its interior room is now no longer cramped and it has built on the chassis strengths of the outgoing model. With leather and wood, it also has a classier interior than any of its direct competitors. He became the first American chief of design of BMW on October 1, 1992. His styling themes have generated intense controversy among automotive designers, and have had a polarizing effect with respect to their visual cues. 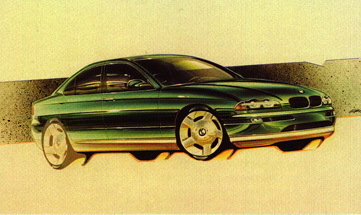 Bangle's designs are incorporated in the entire BMW lineup, including the 1, 3, 5, 6 and 7 series as well as the X3, X5, and X6 the newest design SUVs, and the concept car Gina. 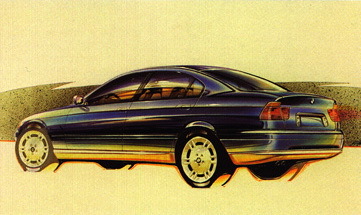 Also, contrary to common belief, Bangle did not design the E46 3 series or the E46 M3 - he over saw some of the design work but did not design the car or have the final say. 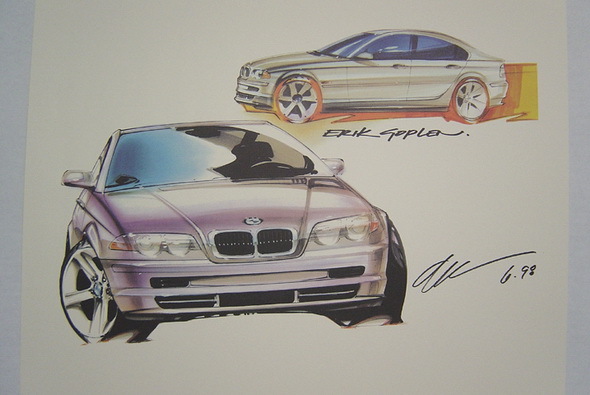 Erik Goplen from BMW DesignWorks USA is the man responsible for the design team that created the E46. in one of his interviews he said: "We have a design heritage to maintain"